Made internationally famous from Jamie Ford's novel "Hotel on the Corner of Bitter and Sweet" , the Panama Hotel has a funky charm--nondescript on the outside but full of history and intrigue. 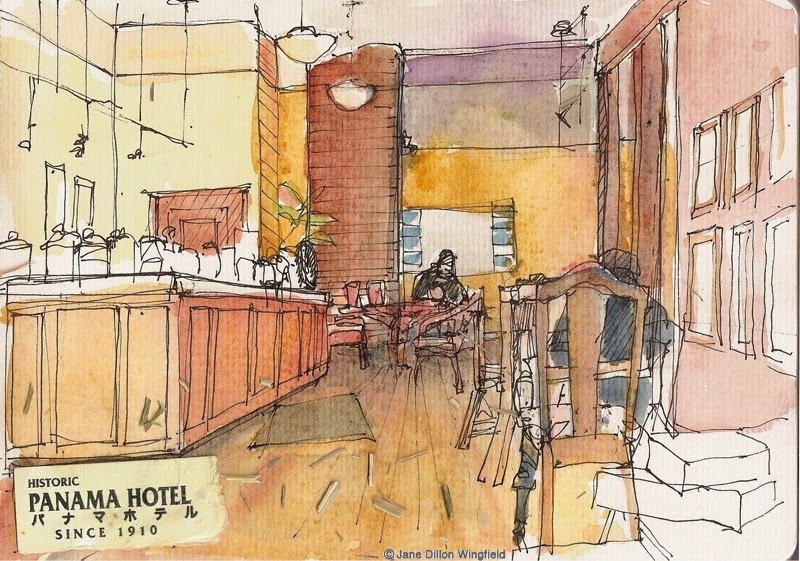 Jan Johnson, a fashion designer who grew up in West Seattle purchased the hotel in 1985 and has renovated it and opened the tea house on the first floor. The shop is fringed with memorabilia and historic photos. They've even cut a window in the floor that provides a view of the basement where artifacts left behind by Japanese as they were forced to leave during the internment. There were five of us there Sunday drawing in the tea room, escaping from the rain and cold. Disappointingly I only got one drawing done. And just as we were about to leave a woman came out and started straightening things. It was the owner, Jan Johnson. She was delighted to see our sketches and told us stories of some of the artwork in the glass cases. It was really a perfect sketching spot for a wet March Sunday morning. I definitely want to go back.